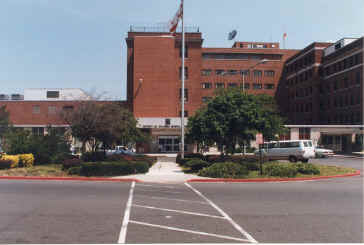 The Board of Directors of the Public Benefit Corporation has recommended transforming D.C. General Hospital into D.C. Community Access Hospital. As part of a broader plan to improve the District's health care system and maximize the impact of public funds, this transition is intended to improve health care delivery for the District's most vulnerable residents. THE NEW D.C. COMMUNITY ACCESS HOSPITAL. Treat patients on an emergency basis. Stabilize patients with more serious conditions and transfer them to an appropriate hospital facility. Connect patients with a community-based primary care facility in their neighborhood. A state-of-the-art emergency room with highly trained doctors and nurses. Modern diagnostic tools and facilities, including a 24-hour full-service laboratory, radiology and pharmaceutical services. Outpatient surgery and clinical procedures. 23-36 hour recuperation and observation beds. Medical problems that require a hospital stay. STRENGTHENING HEALTH CARE IN OUR COMMUNITIES  THE ROLE OF THE PUBLIC BENEFIT CORPORATION. Throughout its years of service to the city, D.C. General has continually evolved to better meet the medical needs of our community. Under the proposed plan, the Board is making a commitment to strengthening its community-based primary care health facilities. In fact, there will be a model primary care clinic adjacent to the D.C. Community Access Hospital on the current campus of D.C. General. This clinic will have extended hours and special treatment for chronic illnesses, such as diabetes or cardiovascular disease. The city has already committed $14.5 million in capital improvements for upgrading and expanding its clinic network, focusing on communities East of the River. QUALITY INPATIENT CARE FOR PBC PATIENTS. The Department of Health, together with the PBC Board, is finalizing contracts with private hospitals for inpatient care. These contracts will ensure that patients can go to hospitals providing welcoming environments, regardless of their insurance status. Ten city agencies are working together to ensure a smooth transition for D.C. General. The working group is considering the future of emergency transportation, employee outplacement and contractual agreements to provide inpatient services at other hospitals. The Williams Administration is taking these steps to ensure the necessary medical and administrative support is in place to transfer patients and records. The changes at D.C. General Hospital will support Mayor Williams' larger effort to reform our health care system for low-income residents. The ultimate goal is to provide a quality, community-based comprehensive system of care for all District residents, regardless of their ability to pay. Towards this goal, the city's public clinics will partner with private clinics to ensure that all neighborhoods have an easily accessible health care facility. Encouraging public-private partnerships to build new clinics where they are most needed. Increasing Medicaid payments and other support for clinics that meet the highest standard of care. Ensuring that city's hospitals meet the needs of the uninsured. Expanding insurance coverage to more residents. Building capacity to educate and enroll residents in insurance programs. MAKING INSURANCE AVAILABLE TO MORE RESIDENTS. Currently, there are 80,000 residents in the District without insurance. The Mayor is committed to expanding health insurance coverage to these residents-so they can choose where they go for health care. "Regardless of where people live, their income, or cultural background, every District resident deserves to have health insurance," said Mayor Williams. What exactly is going to happen to the facilities at the DC General Hospital campus? Throughout its many years of service to the city, DC General has evolved and changed to better meet the medical needs of the community. Under the Hospital Board's new proposal, the new facility would have an emergency room, primary care and specialty clinics, and doctors' offices, as well as a couple of dozen beds that patients could occupy for up to 2336 hours. There would be no inpatient beds for longer stays. The new facility would be known as DC Community Access Hospital. What exactly is a Community Access Hospital? Almost 90 percent of patients who currently come to DC General's Emergency Room will receive treatment on-site that includes assessments by specialists, and 24-hour full-service laboratory, radiology and pharmacy services. Where will gunshot victims be taken once DC General is no longer a Level I trauma center. Once DCGH's transition to a Community Access Hospital is completed, patients with life-threatening trauma, such as gunshot victims that require major surgery, will be transported directly from injury site to one of five remaining Level I trauma centers in the city. In an emergency, won't the extra distance between DC General and the other hospitals - most of which are in Northwest - make a critical difference in survival? Our emergency response teams are trained and equipped to begin critical life saving care as soon as they arrive on scene-long before a patient arrives at a trauma center. In addition, helicopter transport also aids in decreasing transport time for the most critically ill. Currently, Children's Hospital is the only Level I trauma center for children in the whole metropolitan region. Children from the outer suburbs in Virginia and Maryland are regularly transported to the facility, where resources are focused and care is exemplary. With five remaining Level I trauma centers in the city, our adult population will continue to be served well. The city is committed to building on this model. If I live in Southeast, where will I go with a broken leg? Asthma attack? Cut hand? Chest pains? Diabetes-related emergency? People with non-life threatening conditions will still be treated at the Community Access Hospital on the current DC General campus. These patients will also have access to the primary and specialty clinics at the medical center as well as the city's network of community-based clinics. What about patients who would be admitted to DC General. Where will they go under the new proposal? There will be no changes at the hospital until this question is fully answered. Two hospitals have already stepped forward to say they want to provide inpatient care to this population. Under the Mayor's leadership, the city is working with them and other hospitals to assure that they can provide DC General patients first-rate medical care. How can the city ensure that uninsured people will really be welcomed at other hospitals - even if a contract is in place? These contracts will stipulate service standards that must be met, including providing a welcoming environment for all patients regardless of insurance status. The results of the care patients receive are evaluated will be continuously improved. Additionally, the Health Department is working with the PBC Board to institute an effective system for following up on patient concerns, complaints and recommendations. If it's going to cost the city money to send people to other hospitals, why not just invest in DC General? The uninsured and medically vulnerable will have access to excellent hospitals in our city. We must focus on preventive care and "medical homes" -- health care facilities in communities where families can go regularly to a family doctor committed to treating conditions so that they never become serious. Limited public dollars should be spent on neighborhood-based services. The city will spend less on administration and overhead and more on direct care. What does the changes at DC General mean for the bigger health care system in the city? Changes occurring at DCGH are part of a larger effort that the Mayor has undertaken to completely reform our health care delivery system. The ultimate goal is to provide a quality, community-based, comprehensive system of care for all individuals, regardless of their ability to pay. Towards this goal, the city will refurbish existing clinics and build new ones in underserved areas. The Mayor also remains committed to expanding health insurance coverage so that more District residents will have the dignity of choosing where they go for health care. Regardless of where they live, income, or cultural background, every District resident deserves to have health insurance. Who will manage thus transition to a new facility? The city already has a comprehensive contingency plan underway. Officials from the Department of Health, Emergency Medical Services, Employment Services, Emergency Management Agency have been meeting for weeks to develop an orderly plan for the transition to a DC Community Access Hospital. The city is also working with transportation officials to assess whether the transition will require changes in public transportation services. An important part of the contingency plan is issues related to employees who might lose their jobs. Outplacement services will be a major focus of the government's efforts.